Lego Technic Forklift Truck 8835 Boxed with Manual 'Incomplete' Free P&P UK. Condition is Used. Dispatched with Royal Mail 2nd Class. This is a fork lift from the technics range. It has been partially made , but its missing 2 long Lego pieces with holes in which are needed to attach the lifting bit to the vehicle. I think these may have been broken , but should be easily replaced. I have included all remaining Lego technics pieces I have as shown in photo. LEGO Technic Forklift Truck - 8835. 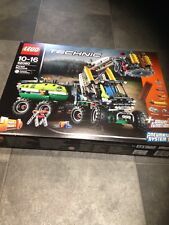 Very cool technic set with more outstanding engineering. 100% complete with instructions and box (slightly worn at the edges). Good used condition - see photos. 8843 FORK LIFT TRUCK IS A TECHNIC SET RELEASED IN 1985. IT FEATURES A RED AND YELLOW FORK LIFT TRUCK WITH LOADS OF FEATURES INCLUDING REAR WHEEL STEERING AND A PNEUMATIC SYSTEM TO OPRATE THE FORKLIFT WHICH IS WORKING. 100% Complete - Have built to confirm if any missing pieces etc. Good condition. Includes parts list (ticked off to confirm all available). LEGO Technic Heavy Duty Forklift - 42079. New listingLego Technic Roadwork Crew - 42060. 2-in-1 Set. Truck, Digger, Gritter. VGC. Lego Technic Roadwork Crew - 42060. 2-in-1 Set. Truck, Digger, Gritter. VGC.. Condition is Used. Dispatched with Royal Mail 2nd Class. Altho this is used, all the parts are checked and there - it is a double model ie two trucks can be made - both books are intact.- box has been opened and resealed - altho it says 8 - 14, my grandson 6, found no problem. LEGO Technic Two Models In One Heavy Duty Forklift And Tow Truck 42079. LEGO® model number: 42079. Forklift truck features rear-wheel steering, 2-cylinder engine with moving pistons, and high-reach forks that can lift and tilt, plus a detailed driver's cab, orange warning beacon and large tires. A uniquely decorated LEGO Technic 40th Anniversary brick is included. 6 x 6 All Terrain Tow Truck. Large chunky tires, heavy-duty bull bar with chain and hook, movable lights and a detailed driver's cab with opening doors. When you feel like another building challenge, rebuild it into a research explorer vehicle. 42029 - Customized Pick up Truck / Forest Skidder. Transport heavy loads over rough terrain with the giant, red Pick Up Truck! 2-in-1 model: rebuilds into a Forest Skidder. BNIB NEW FACTORY SEALED! LEGO TECHNIC 2-IN-1. Rare 2003 Kit, original pieces, original box. (although it'll be sent asap). Sets are 100% complete with instructions for 4 models. Both sets are 2 in 1. Parts are in excellent condition, however it is a used set, so signs of wear are expected. This LEGO Technic Cherry Picker 42088 set can be built together with all other original LEGO sets and LEGO bricks for creative building. LEGO Technic 2-in-1 building sets are compatible with all LEGO construction sets for creative building. 42079 LEGO. Age 9 New For 2018. Technic Heavy Duty Forklift 2-In-1 Set. 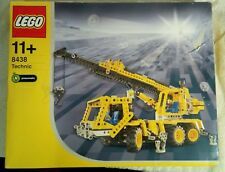 LEGO 42088 Cherry Picker Toy Truck, 2 in 1 Model, Tow Truck, Construction Vehicle Toys for Kids. Item model number: 42088. LEGO Technic 2-in-1 building sets are compatible with all LEGO construction sets for creative building. Trademark LEGO® is a trademark of the LEGO Group, which this page has not sponsored or authorized. The use of the LEGO® trademark is to uniquely identify of the LEGO® products and represents no violation of rights. LEGO® TECHNIC vehicles. Trademark LEGO® is a trademark of the LEGO Group, which this page has not sponsored or authorized. The use of the LEGO® trademark is to uniquely identify of the LEGO® products and represents no violation of rights. LEGO 42080 Technic Forest Machine Forklift Toy Truck, 2 in 1 Model, Power Functions Construction Set for Kids. Item model number: 42080. Enjoy a rewarding build and play experience with the LEGO Technic 42080 Forest Machine. LEGO 42080 Technic Forest Machine Forklift Toy Truck, 2 in 1 Model, Power Functions Construction Set for Kids. Enjoy a rewarding build and play experience with the LEGO Technic 42080 Forest Machine. LEGO Technic 2-in-1 building toys are compatible with all LEGO construction sets for creative building. Enjoy a rewarding build and play experience with the LEGO Technic 42080 Forest Machine. You can also rotate the driver's cab to move the boom through more than 180°. Engage the enhanced pneumatic system and operate the boom and grabber to lift the tree trunks, then rotate the driver's cab to move the load through more than 180°. Enjoy riding this amazing 6 x 6 all-terrain truck crane from Lego Technic and feel its power and strength when performing risky vehicle rescue operations. The vehicle is also equipped with large and powerful tires, a protective bar with chain and hook, moving headlights and a detailed cabin with doors that open. LEGO 42088 Cherry Picker Toy Truck, 2 in 1 Model, Tow Truck, Construction V... .
LEGO 42088 Cherry Picker Toy Truck, 2 in 1 Model, Tow Truck, Construction Vehicle Toys for Kids. We are only happy if you are happy. Need help?. Safety Warning Contains small parts. LEGO 42080 Technic Forest Machine Forklift Toy Truck, 2 in 1 Model, Power Functions Construction Set for Kids. Enjoy a rewarding build and play experience with the LEGO Technic 42080 Forest Machine. You can also rotate the driver's cab to move the boom through more than 180°. LEGO 42070 Technic 6x6 All Terrain Tow RC Truck Toy Motor Kit, 2 in 1 Model... .
LEGO 42070 Technic 6x6 All Terrain Tow RC Truck Toy Motor Kit, 2 in 1 Model, Explorer Toy Vehicle, Power Functions Construction Set. Rebuild this model to create a Research Explorer Vehicle for a double build-and-play experience. 5 out of 5 stars - LEGO 42070 Technic 6x6 All Terrain Tow RC Truck Toy Motor Kit, 2 in 1 Model... .
5 product ratings5 product ratings - LEGO 42070 Technic 6x6 All Terrain Tow RC Truck Toy Motor Kit, 2 in 1 Model... .
LEGO 42080 Technic Forest Machine Forklift Toy Truck, 2 in 1 Model, Power F... .
5 out of 5 stars - LEGO 42080 Technic Forest Machine Forklift Toy Truck, 2 in 1 Model, Power F... .
2 product ratings2 product ratings - LEGO 42080 Technic Forest Machine Forklift Toy Truck, 2 in 1 Model, Power F... .